Making a budget is the first step to financial freedom but sticking to it is in a world of its own. We make a budget with the best of intentions and then life happens and unexpected expenses pop up out of nowhere to mess it all up. Well, I’m here to tell you that it doesn’t always have to be that way. When you can plan for those budget busters as I like to call them, they have less of a chance of screwing up your best laid plans. When you can plan for these expenses they are no longer unexpected and will cause you less stress. You won’t have to worry about how you will pay for them because you will have planned for them. If you still need to start a zero-based budget, here is a step-by-step guide. The first thing to do to manage your budget is to sit down and write down your monthly expenses. You can do this either for the month as a whole or by paycheck. I prefer doing it by paychecks. 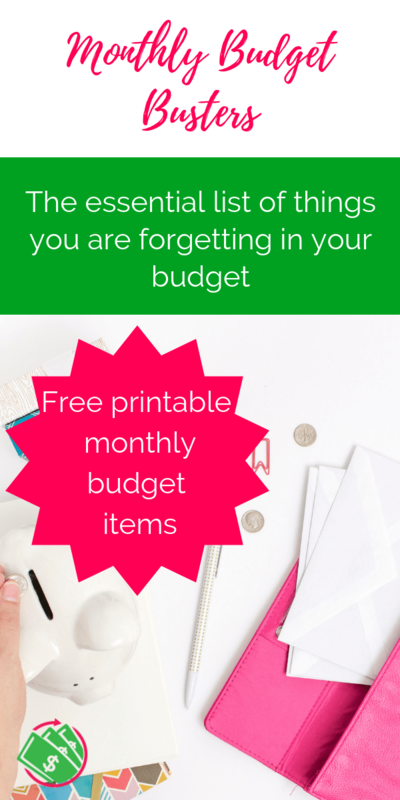 The next thing is to think of budget categories that you need to save for that may not be a monthly bill. You will need to save for these things that may only come up once or a couple times a year. These are saved in “sinking funds”. This would include things like property taxes, vehicle registrations, Christmas, animal costs, and things like that. 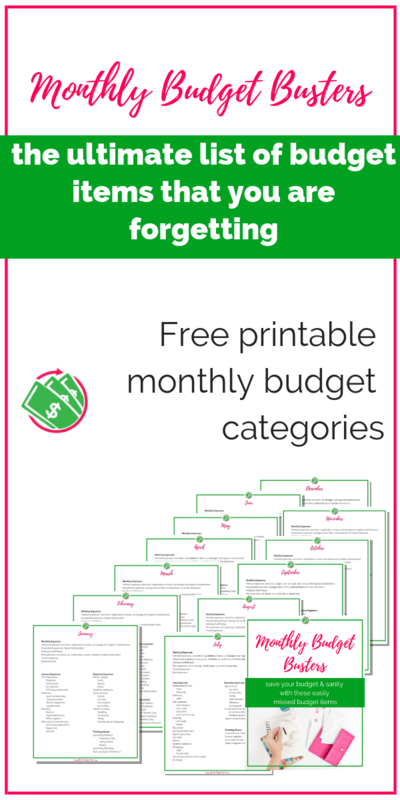 Here is a list of 100+ budget categories to save your sanity. 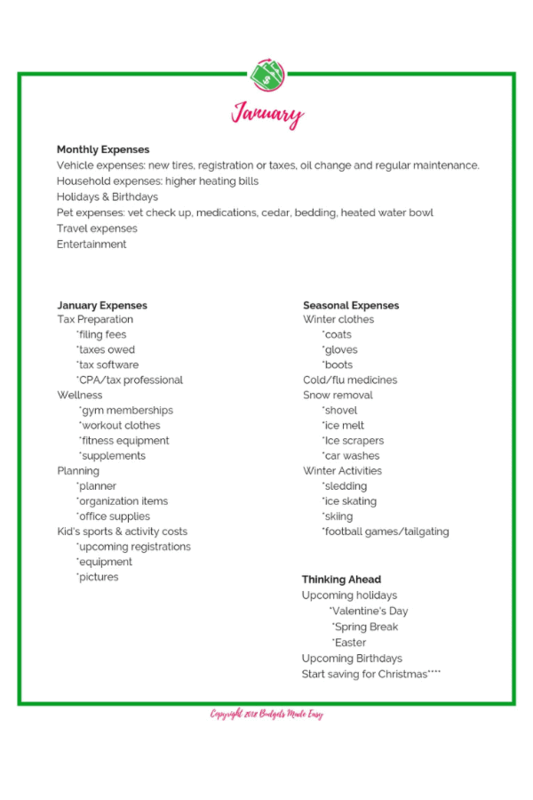 These categories will help you remember and plan for things in your monthly budget. The better prepared you are, the less stressed you will be when something pops up. This will also allow you to save for those things that are truly unexpected. 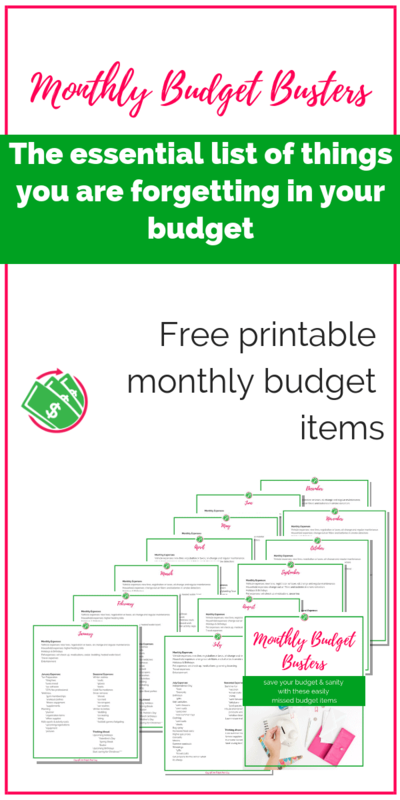 The next thing to do when planning your budget is to break down each month individually. 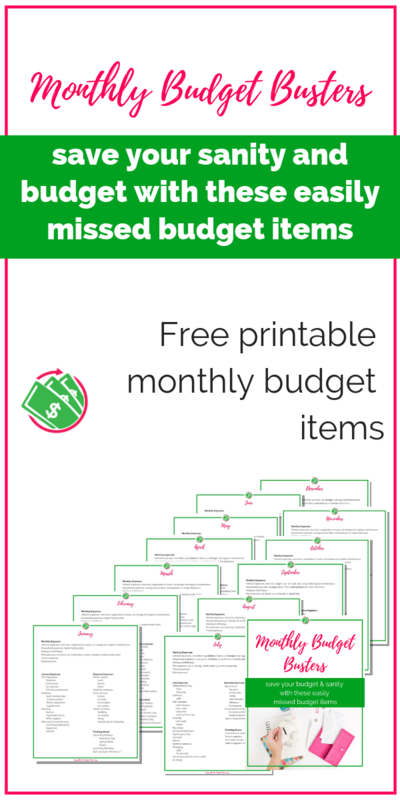 So once you have your general monthly budget ready and your budget categories in place, it’s time to evaluate each month. 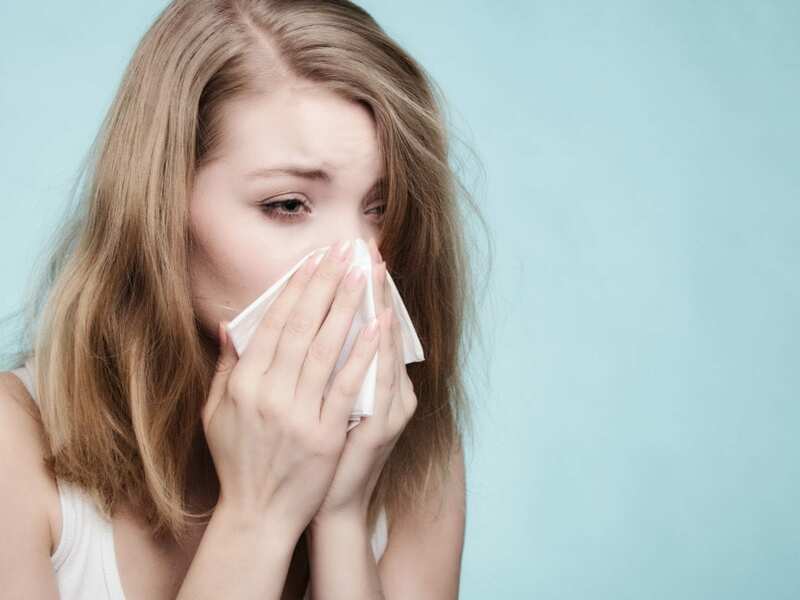 The basics will be the same month to month but each month is different and should be treated as such. 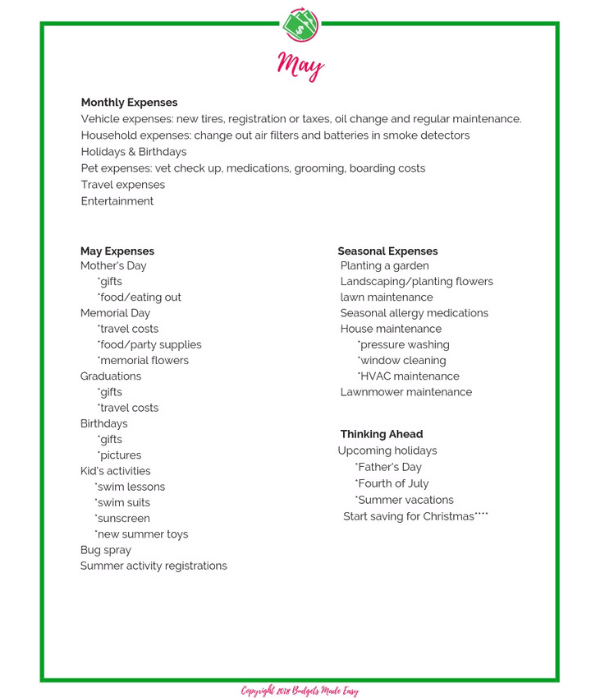 I have created a list for you that details each month’s budget busters to help you remember what may come up in that month. So for instance, January you will need cold and flu medicine, winter clothes, snow preparation, and other things related to winter weather. Those are not things you will need in August. But August has its own unique items for the summertime. 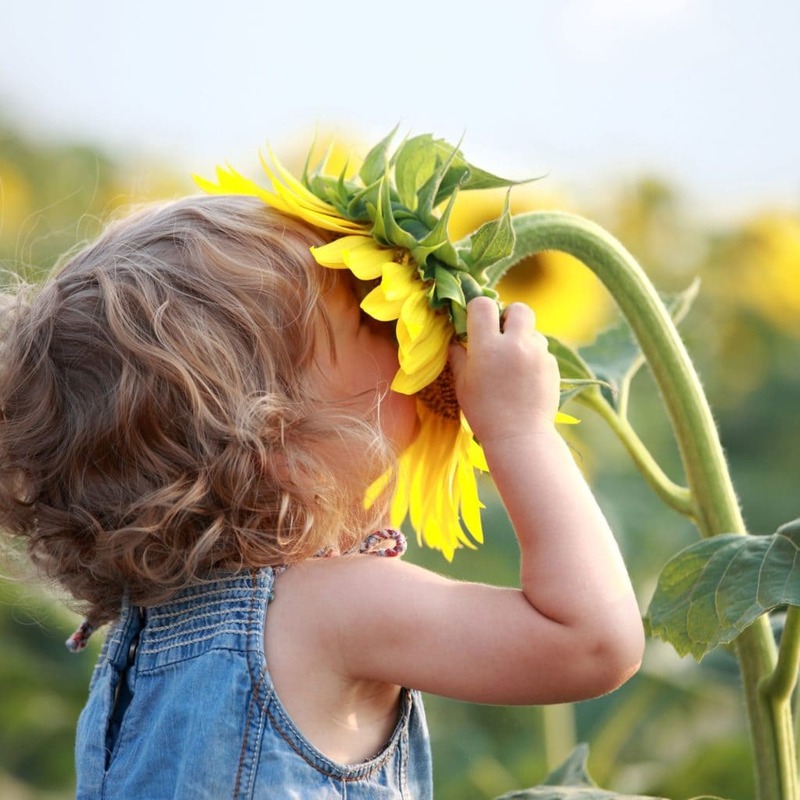 There are also numerous seasonal expenses to consider as well. Those are listed below. January unexpected expenses will include things like tax preparation with seasonal expenses and thinking ahead for the next couple of months. 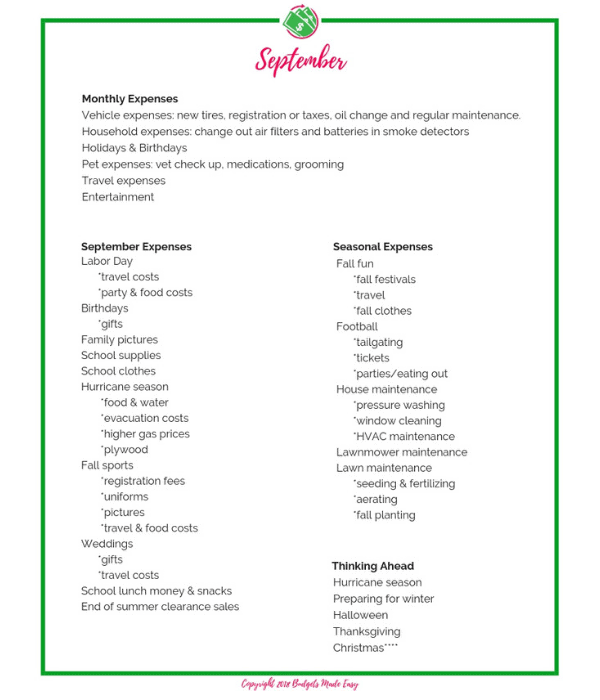 If you can plan for some of these things in the months ahead, then it won’t destroy your budget for that month if you forgot something. February is going to be mostly the same as January except you will have Valentine’s Day and then any birthdays or anniversaries you may have in your family. March will likely depend on where you live. It will be a mix of winter and spring seasonal expenses. You will also need to plan for spring break and Easter. April will be basically the same as March depend on what days your spring break and when Easter is that year. It’s also the time to start thinking about summer expenses. May unexpected expenses will include Mother’s Day, Memorial Day expenses, graduations, and summer for some of you. It’s time to plan summer expenses and of course think ahead toward Christmas! Things that can bust your budget in June include summer vacation costs, childcare costs, summer activities, and increased food and utility bills. You will also want to think ahead for Fourth of July, school supplies, and summer travel costs. July will be very similar to June with the addition of Fourth of July. July is also the time to start preparing for school supplies and the cost of starting a new school year. August will include a mix of summer expenses with school supplies and last minute vacation travel. September will be a mix of summer and fall unexpected expenses. You will have the start of fall activities with the end of summer activities. There will also be Labor Day fun and expenses. October is full on fall madness and there will be a lot of the same things to remember as September. This time of the year is important for yard maintenance and that can be a huge cost if you are not prepared. November can be very expensive but with some planning it doesn’t have to ruin your budget. Thanksgiving costs can be expensive and could have its own budget. Plan your budget for Thanksgiving and then break it down for travel and food costs. December can be the most expensive time of the year. Hopefully with some planning this year will be different. This month will have winter expenses, school expenses, Christmas and New Year’s Eve costs. Hopefully you have been saving for Christmas all year so that gifts won’t completely screw up your budget. I will highly recommend that you prepare a Christmas budget and then break it down for gifts and then to individual gifts, food, travel costs, pictures, and Christmas cards. Decide what is a priority for your time and money and then work your way down the priority list. This will save your sanity and budget. Just as each month is different, each season will be different as well. The good thing about the seasonal expenses is that they last a couple of months so they don’t have to destroy multiple budgets. Winter expenses should include things like ice melt, shovels, winter clothes, savings for missed work and things like that. If you work a job that is effected by the weather then you should plan for days off. There are also football and basket ball games that could effect the budget. It’s also time to start thinking about kid activity registrations. Most places you have to pay a couple of months before practice even starts. You may be thinking about spring sports but have to register in the winter. Spring expenses will include landscaping, lawn maintenance, spring sports fees, equipment costs, and pictures. 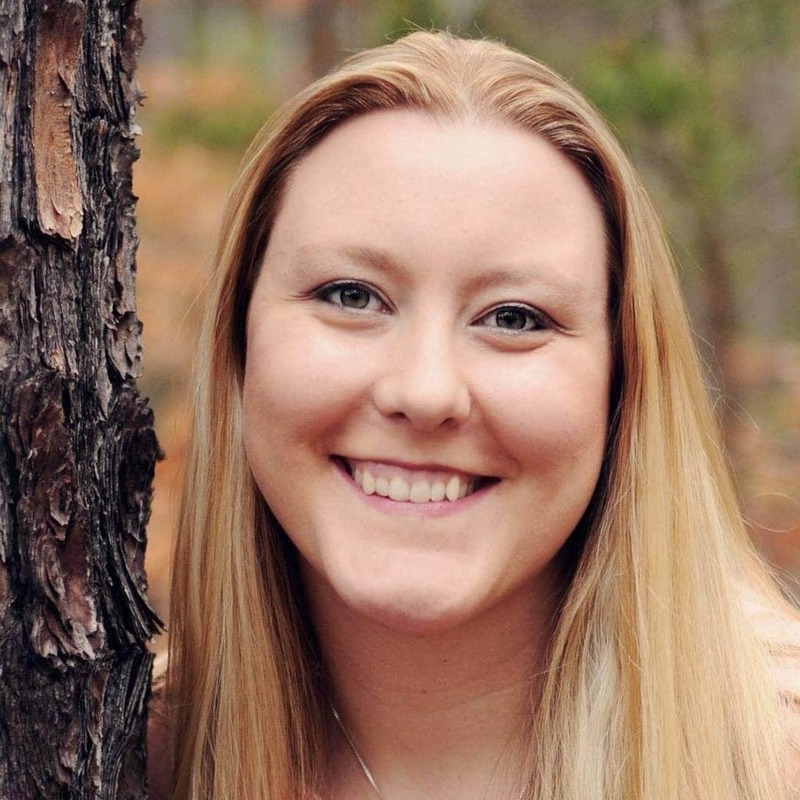 You will also have spring break, graduation costs in addition to numerous holidays. These seasonal expenses could easily wreck your budget if you are not prepared. Summer expenses could include vacations and travel expenses, increased food budget and childcare costs. You may also have higher cooling bills depending on where you live. Fall expenses could include things like lawn maintenance again, leave clean up, lawn mower maintenance, and preparing for the holidays. These budget busters or unexpected monthly expenses are really not that unexpected. We just may forget to plan for these things until it’s too late and it messes up our budget. If you can prepare your budget ahead of time for these easily forgotten items, they won’t be a problem at all. 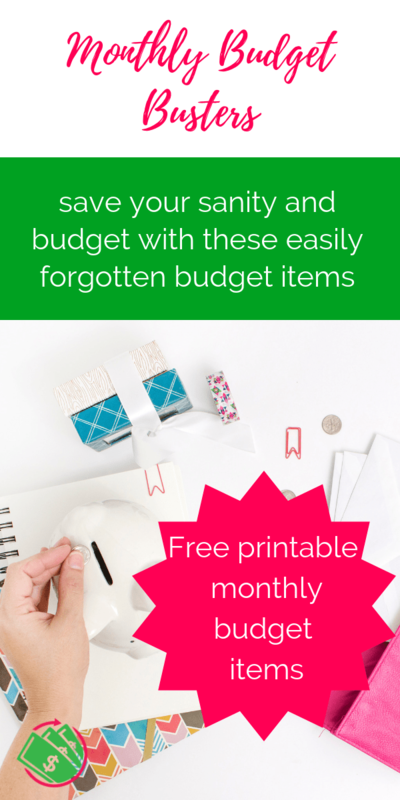 You will save your budget and your sanity. 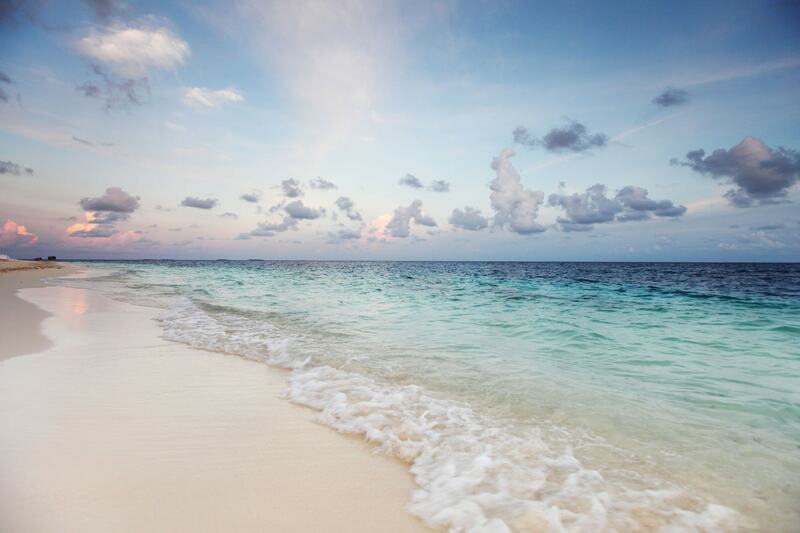 You will be able to stress less and save more. Don’t forget to get your free monthly budget busters list. You can print it and put it in your budget binder to help you remember what to plan for when doing your monthly budget.